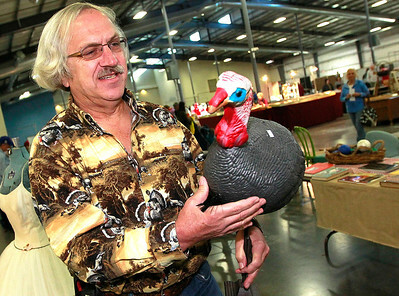 Candace H. Johnson – For Shaw Media Larry Svec, of Wauconda looks at the turkey decoration he bought from Dinner Bell Farm Antiques to add to his collection during the Grayslake Antique & Vintage Market at the Lake County Fairgrounds in Grayslake. 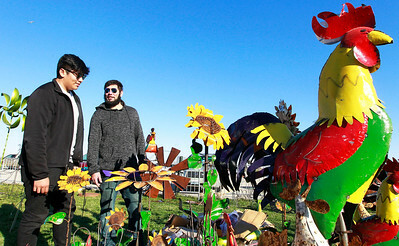 Candace H. Johnson – For Shaw Media Fanel Zavaleta, 16, of Waukegan talks with Taylor Rawson, of Amana, Iowa with The Iron Horizon, about the metal yard art he is selling during the Grayslake Antique & Vintage Market at the Lake County Fairgrounds in Grayslake. Candace H. Johnson – For Shaw Media Lynn Seplowin, (on right) with Unique and Antique, talks to Linda Nowack, her helper, about a necklace she has for sale during the Grayslake Antique & Vintage Market at the Lake County Fairgrounds in Grayslake. 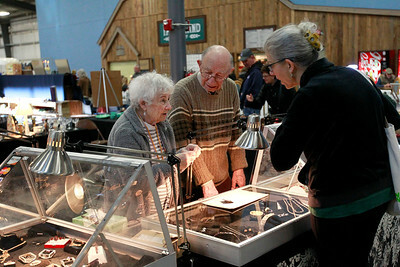 Candace H. Johnson – For Shaw Media The Grayslake Antique & Vintage Market at the Lake County Fairgrounds in Grayslake. 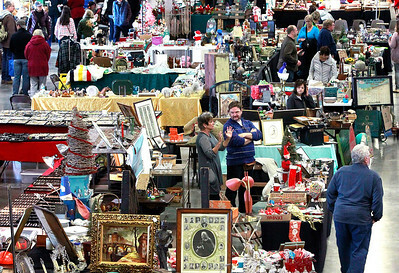 The antique market is put on each month by Zurko's Midwest Promotions. 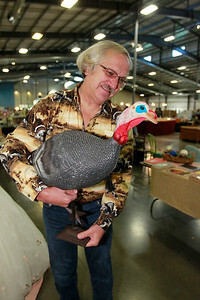 The next one will be held at the Lake County Fairgrounds on December 10th and 11th. 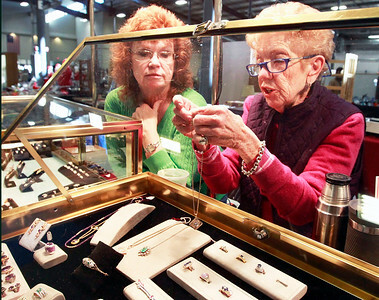 Candace H. Johnson – For Shaw Media Litzi and Harold Marsh, with Gems by Litzi, help Maryam Dachniwskyj, of Pewaukee, Wis., with some antique earrings she is interested in during the Grayslake Antique & Vintage Market at the Lake County Fairgrounds in Grayslake. 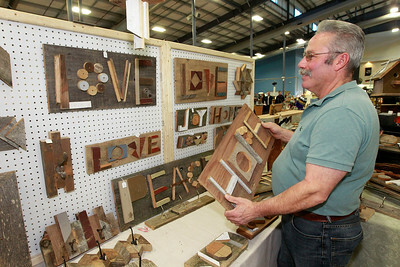 Candace H. Johnson – For Shaw Media Fergie Figueroa, of Ingleside, with FF-Works looks at his LOVE sign made of reclaimed wood during the Grayslake Antique & Vintage Market at the Lake County Fairgrounds in Grayslake. Candace H. Johnson – For Shaw Media Kris Keeler, of Antioch looks at some earrings from the Suzi Fabulous booth during the Grayslake Antique & Vintage Market at the Lake County Fairgrounds in Grayslake. 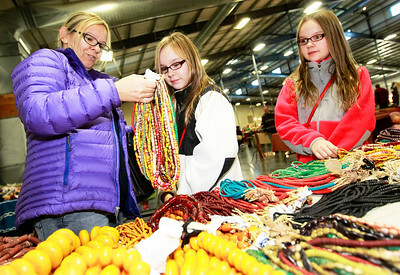 Keeler was at the antique market with her mother, Carole Cozzi, of Round Lake. 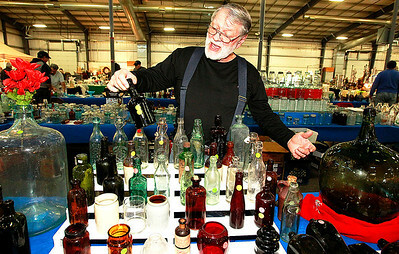 Candace H. Johnson – For Shaw Media Peter Colman, of Ingleside talks about his vintage bottle collection which included a black glass ale bottle, during the Grayslake Antique & Vintage Market at the Lake County Fairgrounds in Grayslake. This month's show in November had a special accent on antique bottles and advertising. 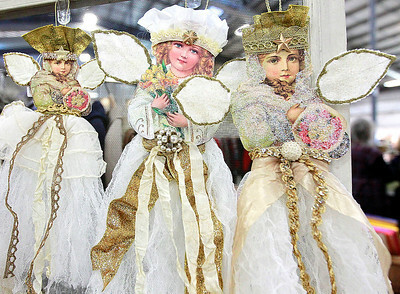 Candace H. Johnson – For Shaw Media Handmade Guardian Angels decorate the Suzi Fabulous booth and were for sale during the Grayslake Antique & Vintage Market at the Lake County Fairgrounds in Grayslake. 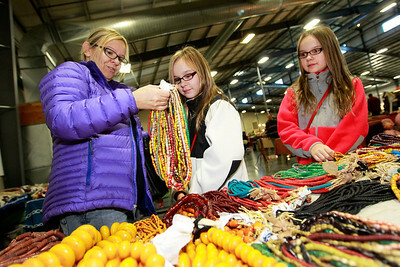 Candace H. Johnson – For Shaw Media Agnes Mikluszka, of Round Lake Beach and her twin daughters, Joann and Isabela, both 11, looks at beads from around the world for sale from Ebrima Kabba & Brothers, during the Grayslake Antique & Vintage Market at the Lake County Fairgrounds in Grayslake. Handmade Guardian Angels decorate the Suzi Fabulous booth and were for sale during the Grayslake Antique & Vintage Market at the Lake County Fairgrounds in Grayslake.